Launching a website is exciting, so much so that people will often rush the process to get their site up. I can understand the appeal of getting a site live as soon as possible, and I always work efficiently to get client sites up and running as soon as possible. However, it is important to double and triple check that a site is functioning correctly and has all of its bases covered before going getting off the ground. Here is a comprehensive website launch checklist. One of the most important things to cover before going live is to test your site in all major browsers. For example, a site can look perfect on a modern browser like Google Chrome, while it may not look and function correctly on an older browser like ie8. Always make sure to test your site on every platform and browser possible. This also includes testing on mobile devices and tablets. I use a number of tools to accomplish this like BrowserStack, a Mac computer, iphone, android phone, desktop PC, etc. By fully testing each site both virtually and with hardware, I ensure that every site is fully functional and properly working on all browsers. Search Engine Optimization (SEO) is what helps you rank in search results. If your site is missing elements like title tags, meta descriptions, and keywords you are going to miss out on a lot of organic search traffic. It is important to do keyword research before starting a web project, and then to implement these findings into the design/dev process. This allows you to create content that focuses on appropriate keywords. SEO is a complex subject matter, but some of the key things to remember before launching are making sure each page has a title tag, meta description, and a focus keyword. Internal links between pages should also be plentiful. This point goes along with SEO and will help increase search rankings and allow the images on your site to be indexed in image search results. Furthermore, they increase the accessibility of your website. Alt tags for images should be relatively short, descriptive, keyword focused, and not spammy. Be sure to make certain that every image on your site has an alt tag before going live. XML Sitemaps are what search engines like Google, Bing, and Yahoo use to read and navigate your site. A sitemap is a complete list of all the pages and posts contained on your site, making it simple for search engines to crawl your site. If your site has takes more than 2-3 seconds to load, you can be certain that users will leave your site pretty quickly. No one has more than a few seconds to wait for the content of your site to load. You should use tools like YSlow to check the speed of your site and look for any issues that may be slowing it down. Speed and optimization should be considered right from the start, and not just an afterthought before launch. Because of this, I focus on building sites that are optimized and quick right from the first line of code. I also utilize plugins like W3 Total Cache to further decrease load times. Grammatical and spelling errors can sometimes be easily overlooked, but nothing looks more unprofessional than mistakes within a sites content. If you have a great deal of misspelled words, why should someone trust you or your product? Always be sure to have a numberof people proof read all of your sites content before going live. To piggy-back off of the last item, be sure to check that all of the content (both text and images) are not simply placeholders, but the final content. It is a common practice to add in dummy text and images during a website build while waiting on the final content. This placeholder content can easily be overlooked if you’re not careful. Always be sure to make sure all of the links on your site point to the correct source. This is especially important for internal links within your site. Sometimes page url’s get changed, or pages get removed or replaced. Do a final click through of all links contained in your site to make sure they land on their correct destination. An analytics application will allow you to track the traffic coming into your website. I personally use Google Analytics, but there are some other great services out there. A good analytics application will fill you in on the specifics of your traffic, including: search queries, visited pages, bounce rate, traffic sources, and much more. It is important to consistently monitor this activity so you can make any appropriate changes to the content of your website. It is nice to have some piece of mind that your site is properly protected and secured from malicious bots and hackers. There are a number of ways to protect your site, but two of the key aspects are having a robots.txt file that blocks access to sensitive pages, and a .htaccess file that disables browsing of certain files and such. If you’ve ever had a hard drive crash or lost a file, you know the pain and headache that losing data can bring. Can you imagine losing your whole website? To avoid this, it is important to consistently backup all of your site’s content and to make sure that these backups are stored in a secure location. For client sites, I always set up automatic, scheduled backups to help make sure everything can be restored in the unlikely event of a site going down. There are numerous site monitoring services that will inform you if/when your site goes offline and for how long. While most web hosts guarantee 99.9% uptime, there are rare occasions when a website can go down. It is nice to have a service in place that will notify you if that occurs. A Favicon is the tiny icon that typically displays beside your page title in the browser tab. Depending on the browser, it can also be found un the url field beside the web address. There are a number of additional locations that the favicon may be displayed. This icon helps with brand recognition and adds a touch of professionalism to your site. This is one of the most important items on the list. Your site should be easy to navigate and maneuver around for your users. Make sure the content has a hierarchy and that there are calls to action where necessary. While usability is something that should be focused on from the very beginning of a design project, you should always do a great deal of testing before going live. A/B testing can be a good idea to test the waters on alternate page layouts and see which one is getting more results. You’ll notice that most sites you visit will have a copyright notice with a date in the footer of each page. This lets people know that the content within your site is protected and not to be used without permission. Cheers to a Successful Launch! 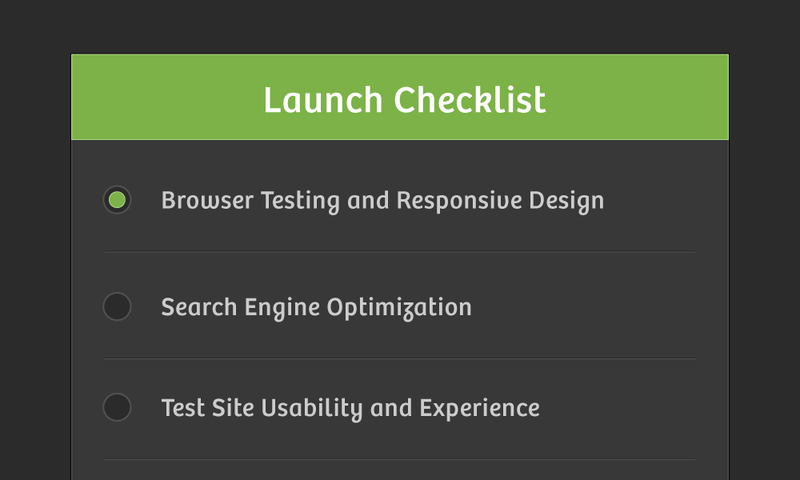 I hope this website launch checklist proved to be helpful. These are just 15 items from a long list that I go through before launching a clients website. I’m in the process of working through this comprehensive website launch checklist right now with a few client projects, so check my portfolio in a few weeks to see some fresh work.